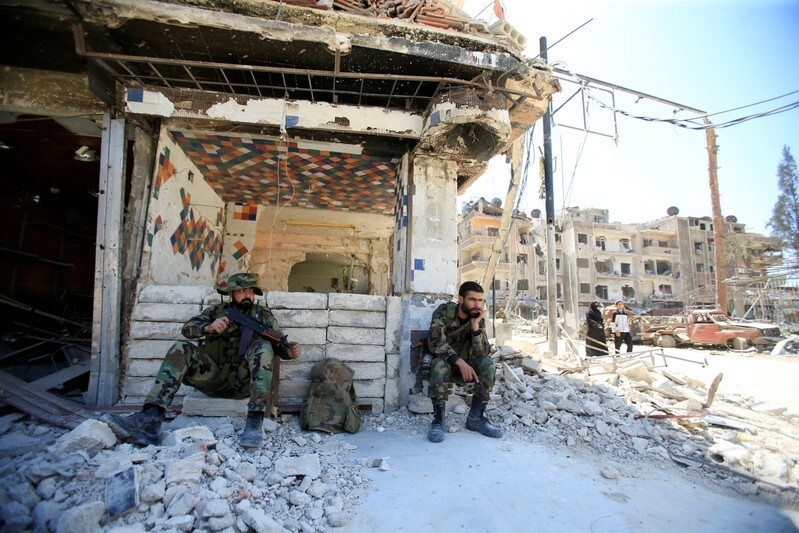 BEIRUT (Reuters) – The Syrian army began preparatory shelling for an assault on the last area outside its control near Damascus on Tuesday, a commander in the pro-government alliance said, building on its recent capture of the major suburb of eastern Ghouta. Yarmouk, Syria’s biggest camp for Palestinian refugees since the mid-20th century, has been under the control of Islamic State fighters for several years. Although the vast majority of residents have fled, the United Nations says thousands remain. Assad has benefited from Russian air power since 2015 to regain large swathes of Syria, putting him in his strongest position since the early months of the seven-year-old war. The war has killed more than 500,000 people and has drawn in regional and global powers. The United States, Britain and France launched their first coordinated strikes against Assad’s government on Saturday in retaliation for what they say was a poison gas attack on April 7 that killed scores of residents in Douma, the last town in the eastern Ghouta to fall. The Western missiles destroyed three targets that had been evacuated in advance, but did nothing to alter the wider course of the war, leaving Assad’s Russian-backed forces still on the offensive with the goal of recapturing the entire country. Damascus and Moscow have both denied using poison gas and have broadcast statements from hospital workers in Douma – which medical aid groups operating in rebel areas have dismissed as propaganda – saying that no chemical attack took place. Syrian state media reported that missiles had again targeted an airbase overnight, but a commander in the regional military alliance backing the government later told Reuters it was a false alarm. 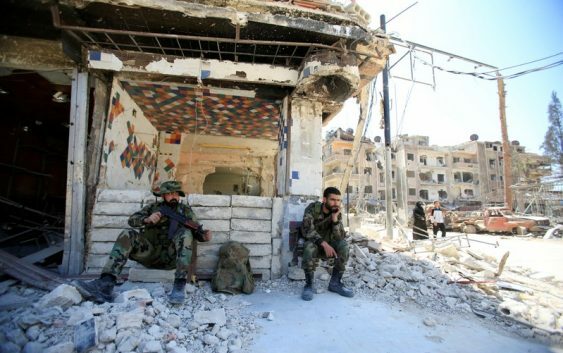 The commander, speaking on condition of anonymity, said the new offensive would target Islamic State and Nusra Front militants in Yarmouk camp and al-Hajar al-Aswad district. Rebels in the adjoining Beit Sahm area would withdraw on buses through an agreement with the government, the commander said. A government media tour on Monday of Douma, the biggest town in the former rebel enclave of eastern Ghouta just outside Damascus, revealed severe destruction and the plight of residents who had survived years of siege. The assault on eastern Ghouta began in February and ended in government victory on Saturday when rebels withdrew from the town, hours after the Western countries were finished with their air strikes on buildings they said were used to research or store chemical weapons and equipment. The pro-government commander said the army had prepared for military action in the Eastern Qalamoun, but that Russia was working on the militants’ withdrawal without a battle. State television said on Tuesday that rebels in Dumayr had also agreed to withdraw. In northwest Syria, the largest area still held by rebels, a government assault could bring Damascus into confrontation with Turkey, which has set up a string of military observation posts in the area. Ali Akbar Velayati, a top Iranian official, said during a visit to Damascus last week that he hoped that the army would soon regain Idlib and areas of eastern Syria now held by an alliance of Kurdish and Arab militias backed by Washington.